Discover the opulent world of royal court intrigue, exotic ceremonies on towering pyramids, shamanic journeys, calendars and healing sciences of the ancient Mayas. Experience the excitement of sacrificial rituals and strategic battles for dominance in this exquisite city soaring in mountain mists. A dynasty hangs in the balance . . .
My Review: The Visionary Mayan Queen is about the Mayans first female ruler. 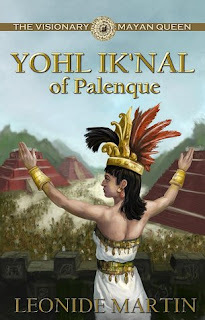 Yohl Ik'nal is the only surviving child of Kan Bahlam I, the ruler of the Palenque. Yohl Ik'nal is trained to become the next ruler of the Palenque. There has never been a woman ruler before, and Yohl Ik'nal must bear the weight of the responsibility. She has a vision that her reign could lead to the downfall of her kingdom. When Yohl Ik'nal becomes ruler, she faces many challenges. She knows that each decision she makes could either save or bring ruin to her own people. She wonders if the successor should be her weak son or her strong-willed daughter. She also learns that there is a conspiracy of nobles, who dissent her reign that are planning on bringing destruction to her city. Does Yohl Ik'nal have what it takes to save the kingdom or must she witness the decline of her dynasty? I was eager to read The Visionary Mayan Queen because I did not know much about the Mayans. Yohl Ik'nal’s story intrigued me because she was a woman ruler of the Palanque, a great city in the jungle that the Mayans eventually abandoned. I wanted to learn more about who she was. In this novel, Yohl Ik'nal starts out as an idealistic girl. She dreams of traveling to far away places. However, she has to quickly mature once she is the chosen successor. Throughout the novel, I thought that Yohl Ik'nal was a strong and capable ruler. She cared about her kingdom and wanted to lead it into greatness rather than see it into its decline. She was beset by hard choices, and I thought that she made wise ones. Overall, this was an intriguing novel about an unknown ancient Mayan queen. Except for Yohl Ik'nal, I thought there was not much development with secondary characters. The novel seemed rushed in most parts, especially the battle scenes. There was a lot of telling instead of showing, and this made it hard for me to experience it. I also did not like how the story suddenly switched to the 1992 discovery of an ancient Mayan tomb in the middle of the plot. It was jarring and could have been added at the end or left out. However, the author showed that she clearly did her research on Mayan history and culture. She brought the abandoned city of Palenque to life. The Visionary Mayan Queen is full of political and courtly intrigue, drama, and romance that is sure to treat historical fiction lovers. I am excited to read the next book in the series, The Controversial Mayan Queen, which is about Yohl Ik'nal’s daughter Sak K’uk. This novel will certainly be a refreshing read for those who want to take a break from the usual European or United States setting novels.